This species is accepted, and its native range is Eritrea to S. Africa. Flowers in few–several-flowered dichasial cymes arranged in unelaborated and lax to quite extensive and elongate panicles 6.5–15(30) cm long; peduncles 0–7 cm long, secondary peduncles up to 4 cm long; apparent stalks 1–2.5 cm long but true pedicels 3–5 mm long Flowers in few–several-flowered dichasial cymes arranged in unelaborated and lax to quite extensive and elongate panicles 6.5–15(30) cm long; peduncles 0–7 cm long, secondary peduncles up to 4 cm long; apparent stalks 1–2.5 cm long but true pedicels 3–5 mm long. Corolla asymmetrical in bud expanding abruptly on anterior side, usually greenish with a white to pale blue to lilac limb, the median lobe dark blue; tube 5–7 mm long, pubescent at the throat; lobes unequal, (0.6)1–1.9(2) cm × (1.5)3.5–7.5 mm, the upper obovate, the lower one spathulate and much larger than the other four Corolla deep sky-blue; limb when in bud c. 5.5 mm in diameter, subspherical, glabrous, almost black Corolla deep sky-blue, glabrous outside. Corolla usually greenish with a white to pale blue to lilac or purplish limb, the median lobe dark blue; ± pubescent or tomentose, limb glabrous when in bud Corolla usually with the 5 lobes all of the same colour, either lilac, blue or bluish-purple, rarely with 4 lobes greenish and the fifth (median lobe) coloured Corolla asymmetrical in bud expanding abruptly on anterior side, usually greenish with a white to pale blue to lilac limb, the median lobe dark blue; tube 5–7 mm long, pubescent at the throat; lobes unequal, (0.6)1–1.9(2) cm × (1.5)3.5–7.5 mm, the upper obovate, the lower one spathulate and much larger than the other four. Fruit ± black, 5–6 × 8–10 mm, subglobose, depressed, mostly deeply 4-lobed, glabrous. Fruit shiny black when ripe. Fruit 7 × 9–12 mm. Fruit shiny black when ripe. Fruit black when ripe. Fruit ± black, 5–6 × 8–10 mm, subglobose, depressed, mostly deeply 4-lobed, glabrous. subsp. namibiensis, from Namibia, differs mainly in having the flowers arranged in axillary cymes not terminal panicles, and in the corolla being white or with 4 lobes whitish-green and the median lobe blue, not with all lobes violet. Subspecies mafiensis Verdc., ussukumae Verdc., austromonticola Verdc., napperae Verdc. and muenzneri Verdc. occur in Tanzania only. 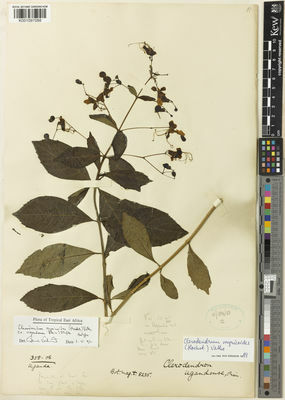 Fanshawe 1842 (FHO; K), from Serenje (Zambia, C:), referred to Clerodendrum myricoides by White (For. Fl. N. Rhod. : 366), approaches var. capiriensis , but has longer branches ending in panicles, and has a pubescent indumentum particularly on the branches but also on the leaves and inflorescences. This is considered to be intermediate between var. capiriense and var. discolor . Other Zambian material, e.g., Robinson 2613 (K; SRGH) from Mkushi and Richards 1975, from Mbala, also approaches var. capiriense in possessing obovate leaves and short calyx lobes (c. 1 mm long). However, the ± dense indumentum, the larger discolorous leaves and the terminal inflorescences place these in var. discolor. Some specimens of var. discolor from Malawi, [ Richards 10575 (K; SRGH) and Pawek 6278 (K; SRGH) from Karonga Distr., and Brummitt, Polhill & Banda 16109 (K) from Kasungu Distr. ], approach var. eleanorae in the shape of their leaves. However, the smaller distinctly discolorous leaves, and the somewhat crisped hairs of the indumentum place these specimens clearly in var. discolor . This variety approaches C. luembense De Wild. in the nature of its indumentum, but differs in the shape of the leaves. The specimens McClounie 27 and 107, both from Nyika Plateau (Malawi), collected in Nymkowa Hills and Mwanemba respectively, have narrow lanceolate leaves acute at the base and apex, and these are considered to represent one extreme in the range of leaf variation in var. discolor . Swynnerton (1296, K) records that: i) the chiNdao name is “Bukusa”, and ii) the wood is much used for “fire sticks”, for lighting fires by friction. Specimens with leaves very attenuate towards the base and a looser indumentum than is usual are taken to be intermediate between var. discolor forma discolor and var. myricoides . Some specimens with unusually large leaves, e.g. Torre & Correia 14969 (LISC) from Mozambique [Zambesia Prov., 3 km from Ile Mt.] with leaves up to 24.5 × 11.6 cm, and Faulkner 104 (K) from Mozambique [Quelimane Distr., Tacuane] with leaves up to 17.8 × 8 cm, probably come from sucker or coppice growth. Macêdo 5130, from Mozambique [Tete Prov., between Marueira and Songo (LISC; LMA; LMU; SRGH)], appears to be different because it has internodes longer towards the end of the branches with leaves persistent on the flowering branches and all ± similar in shape size and colour. However, such characters often in combination also occur in material that is clearly forma discolor . Macêdo 5130 is therefore included in forma discolor. var. myricoides appears to be more coastal in its distribution, and although it extends somewhat inland at lower altitudes it has not been recorded growing naturally in those areas where var. discolor (Klotzsch) Baker is more frequent. The specimens of var. myricoides seen from Harare are probably from cultivated plants. Distinguished from forma alatipetiolata by the larger broader leaves, up to 12.5 × 8.7 cm, the leaf margin irregularly lobed or crenate-lobed, and by the lobed usually undulate petiole wings. The reflexed calyx lobes are found in all flowers of this forma, whether opened or still in bud. Sometimes the calyx lobes of forma discolor can be reflexed, but in these cases it appears that this has been the result of placing the specimens in a plant press. Specimens of forma discolor in which reflexed calyx lobes have been observed include: Gilges 507 (K; PRE; SRGH) and Robinson 2935 (K; M) from Zambia; Goldsmith 101/61 (K; LISC; SRGH); Gosnell 115 (SRGH); Leach 11286 (BR; COI; K; LISC; M; SRGH); O.B. Miller 1140 (K; PRE; SRGH); Noel 2374 (BM; COI; LISC; SRGH); Norrgrann 399 (K; SRGH); Monro s.n. and 2284 (BM) from Zimbabwe and Torre & Correia 13983 (LISC) from Mozambique. Distinguished from forma discolor by the subcylindrical calyx tube, and distinguished from forma reflexilobata and from specimens of forma discolor with some reflexed calyx lobes, by the relatively shorter calyx lobes. Distinguished from forma discolor by the leaf lamina narrowly long decurrent almost to the point of attachment, producing a winged petiole with entire margins. Davies 2540 (SRGH), cited above, differs somewhat in its smaller leaves, small floral buds and small calyx 2.75–3 mm long, with lobes c. 1.5 mm long, but cannot otherwise be kept separate from var. myricoides . In a few specimens from Mozambique the leaves are very large, up to c. 17 cm long (cf. R. Fernandes, op. cit. : note on C. schlechteri ). These may come from sucker or coppice shoots or plants from shady places. Differs from typical R. myricoides in its calyx lobes which are c. 2.75 mm long, slightly exceeding the calyx tube in length, and which are lanceolate narrowing slightly towards the acute apex. Calyx c. 3 mm long, glabrous, drying black; lobes c. 1 mm long, semicircular Calyx often entirely purplish or crimson-margined, glabrous to hairy; tube cupular, c. 2.5 mm long; lobes semicircular to ovate or triangular, 1.2–5 mm long, quite rounded, obtuse or ± acute Calyx 2.5–3 mm long, campanulate, ± pilose below; lobes c. 1 mm long and 1.75 mm wide at the base, purple edged Calyx small, 2–3.5 mm long, campanulate, usually glabrous or rarely sparsely appressed pilose; lobes 0.5–1.5 mm long, semicircular Calyx (2.75)3.25–5 mm long, campanulate, usually glabrous; lobes less than half as long as the tube, usually semicircular or sometimes oblong or lanceolate Calyx (2–3)3.5–5.5(7) mm long, ± pubescent; lobes (1.5)2–2.5(3.5) mm long, usually semicircular, sometimes oblong-semicircular or lanceolate, usually erect or sometimes ± reflexed, ciliate on the margin Calyx often entirely purplish or crimson-margined, glabrous to hairy; tube cupular, c. 2.5 mm long; lobes semicircular to ovate or triangular, 1.2–5 mm long, quite rounded, obtuse or ± acute. Not seen elsewhere. On rocky hill top, amongst granite rocks; c. 1250 m. Not known elsewhere. Sand forest patch; c. 480 m. Miombo and open mixed deciduous woodlands, on sandy soils and rocky slopes, on lake shores and beside seasonal rivers often among boulders, in riverine forest, and on margins of swamp forest and evergreen rainforest, in thickets on termitaria and mutemwa thickets on Kalahari Sand; also in old cultivation; 70–1600 m. Coastal plains and dunes on sandy soil, usually in dense thickets; also in wooded grassland, deciduous woodland, riverine forest and low altitude mixed evergreen forest; 5–1000 m. Not known elsewhere. Sand veld, on rocky outcrops and amongst boulders; also in riverine forest; 1000–1400 m. Not known elsewhere. In deciduous forest; 700–1500 m. Not known elsewhere. Ecology unknown. Granite outcrops, amongst rocks; c. 800 m. "In thicket understorey of Acacia woodland ""munga"" on a limestone scarp; c. 1280 m." Not known elsewhere. Not known elsewhere. Ecology not known. In shelter of granite boulder; c. 1024 m. Not known elsewhere. Stamens and style long-exserted and curving upwards. Shrub, subshrub or subshrubby herb, rarely a small tree, usually much branched, 0.9–2.4(–6) m. tall; branches pale brown, ridged or angular, at length with ± corky bark, glabrous to velvety. Leaves opposite or in whorls of 3–4; blades narrowly to broadly elliptic, ovate-elliptic or oblanceolate, oblong or obovate, 2–15(–19.5) cm. long, 0.4–6(–10) cm. wide, usually small but in cultivation can attain large dimensions, acute to acuminate at the apex, cuneate at the base (in one subsp. narrowed to an oblong base), entire to coarsely serrate, glabrous or pubescent to densely velvety, glandular-punctate beneath, ± sessile, or petiole up to 1.5 cm. long. Flowers in few–several-flowered dichasial cymes arranged in unelaborated and lax to quite extensive and elongate panicles 6.5–15(–30) cm. long; peduncles 0–7 cm. long, secondary peduncles up to 4 cm. long; apparent stalks 1–2.5 cm. long but true pedicels 3–5 mm. long. Calyx often entirely purplish or crimson-margined, glabrous to hairy; tube cupular, ± 2.5 mm. long; lobes semicircular to ovate or triangular, 1.2–5 mm. long, quite rounded, obtuse or ± acute. Corolla usually greenish with white to pale blue to lilac limb, the anterior lobe dark blue; tube 5–7 mm. long, pubescent at the throat; lobes unequal, (0.6–)1–1.9(–2) cm. long, (1.5–)3.5–7.5 mm. wide, the upper obovate, the lower one spathulate. Stamens and style well exserted. Fruit ± black, subglobose, depressed, 5–6 mm. long, 8–10 mm. wide, mostly deeply 4-lobed, glabrous. Rotheca myricoides subsp. austromonticola (Verdc.) Verdc. Rotheca myricoides var. capiriensis (R.Fern.) R.Fern. Rotheca myricoides var. discolor (Klotzsch) Verdc. Rotheca myricoides var. dumalis (Hiern) R.Fern. Rotheca myricoides var. eleanorae (R.Fern.) R.Fern. Rotheca myricoides subsp. mafiensis (Verdc.) Verdc. Rotheca myricoides var. moldenkei (R.Fern.) R.Fern. Rotheca myricoides subsp. muenzneri (B.Thomas) Verdc. Rotheca myricoides subsp. namibiensis (R.Fern.) R.Fern. Rotheca myricoides subsp. napperae (Verdc.) Verdc. Rotheca myricoides subsp. ussukumae (Verdc.) Verdc. Rotheca myricoides var. viridiflora (Verdc.) Verdc. M. Coates Palgrave, ed. 3 of K. Coates Palgrave, Trees South. Africa: 990 (2002). Kew Bull. 55 : 150 (2000). Mem. Soc. Brot. 30 : 47 (1998)*. Mem. Soc. Brot. 30 : 48 (1998). Mem. Soc. Brot. 30 : 49 (1998) in adnot. Mem. Soc. Brot. 30 : 50 (1998) in adnot. Mem. Soc. Brot. 30 : 53 (1998) in adnot. Mem. Soc. Brot. 30 : 54 (1998) in adnot . Mem. Soc. Brot. 30 : 56 (1998). Mem. Soc. Brot. 30 : 58 (1998) in adnot. Mem. Soc. Brot. 30 : 60 (1998) in adnot. Mem. Soc. Brot. 30 : 63 (1998) in adnot. nom. illegit ., non De Wild. (1914). Mem. Soc. Brot. 30 : 65 (1998) in adnot. Mem. Soc. Brot. 30 : 67 (1998) in adnot. Mem. Soc. Brot. 30 : 68 (1998) in adnot. nom. inval . Mem. Soc. Brot. 30 : 68–70 (1998) in adnot. Mem. Soc. Brot. 30 : 71 (1998) in adnot. Mem. Soc. Brot. 30 : 71 (1998) in adnot. nom. inval . F.T.E.A., Verbenaceae: 135 (1992) in adnot. Phytologia 62 : 328, 452 (1987). Phytologia 59 : 255 (1986). Phytologia 59 : 262 (1986). Phytologia 59 : 263–264 (1986). Phytologia 59 : 264–267 (1986) pro parte. Phytologia 59 : 267–268 (1986). Troupin, Fl. Rwanda 3 : 276 (1985) in adnot. Troupin, Fl. Rwanda 3 : 276 (1985) pro parte. Kirkia 10 : 272 (1975) pro parte quoad Goldsmith 101/61. White, For. Fl. N. Rhod. : 366 (1962) quoad specim. White 1951 & 3677, non (Hochst) Vatke. Estud. Ensaios Doc. Junta Invest. Ci. Ultramar [in Mendonça, Contrib. Conhec. Fl. Moçamb., II] 12 : 169 (1954) pro max. parte. Brenan, Check-list For. Trees Shrubs Tang. Terr. : 632 (1949) pro parte. Brenan, Check-list For. Trees Shrubs Tang. Terr. : 632 (1949). Robyns, Fl. Sperm. Parc Nat. Alb. 2 : 147 (1947). Bot. Jahrb. Syst. 68 : 84 (1936). Bot. Jahrb. Syst. 68 : 85 (1936). Bot. Jahrb. Syst. 68 : 86 (1936). Strugnell, A.M. (2006). A checklist of the Spermatophytes of Mt. Mulanje, Malawi Scripta Botanica Belgica 34: 1-199.